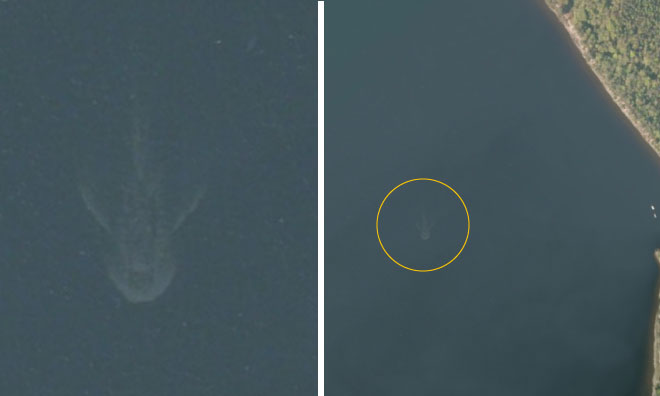 One of the world's most enduring mysteries added another layer recently, as amateur sleuths have discovered what they claim to be the Loch Ness Monster lurking under the water of the famous lake using satellite imagery from Apple Maps, after finding Google's monster tracking solutions unworkable. "It was purely by accident that I came across the image," Loch Ness Monster enthusiast Andy Dixon told the Daily Mail. "I was trawling through satellite transmissions of different parts of the country and I thought I would try Loch Ness." "I could see something big under the water and I saved it to my phone. My first thought was that it was the monster and I contacted Gary Campbell of the Official Loch Ness Monster Club," he added. Unofficial clubs have yet to weigh in. Campbell noted that the ghoulish image does not appear on Google's satellite images of the loch, only those used by Apple's mapping application. Apple's overhead imagery is provided by satellite firm DigitalGlobe, though it is not immediately clear what Apple or DigitalGlobe have done to make the combined solution more suitable for those combing for cryptids. While the anomaly initially appears to be the wake of a boat, "experts" have noted that it is unlikely as there is no visible hull or superstructure. Imaging errors are also unlikely, as other boats in the area are clearly visible, making the appearance of a mythical creature clearly the more reasonable explanation. "What ever it is, it's just below the surface and heading south so unless there have been secret submarine trials going on in the loch, the size of the object would make it likely to be Nessie," Campbell said. "Nessie" can be viewed by clicking here on an iOS device or Mac running OS X Mavericks.